There was a bit of an uptick in storm activity yesterday, and the ALERT network had 4 sites with rainfall. Image above is looking south from Kitt Peak around 2 pm MST - two south-to-north updrafts ahead of rain showers to the far south. Interior southern California had more widespread activity yesterday, with several severe storms reported. Flagstaff apparently had a severe, convective gust of 62 mph a bit before 3 pm. However, metro Tucson mostly saw thick anvil streaming in from the southwest (below is visible satellite image from 5:30 pm MST). An outflow moved across the metro area around 4:30 pm, from the storms to the southwest. But, mostly another dry day - no rain since the event of the 22nd here at the house. The 100+ temperatures have really dried things out. This morning PW continues to increase slowly, with amounts of 1.50" and higher from Tucson west to southern California. 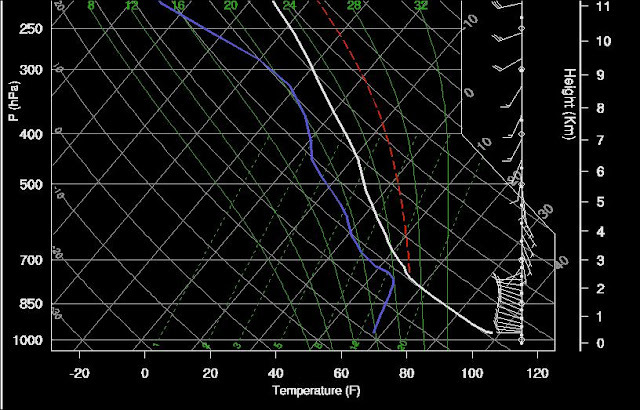 However, CAPE is low low (morning sounding plot for Tucson is below, from SPC), except for higher elevations. Low-level winds will continue to advect higher moisture toward the east and storm anvils will again stream off toward the northeast. No early WRF again today. This morning's NAM forecasts storms this afternoon and evening, again over higher elevations and to the southwest of Tucson. It was noticeably more humid this morning, as low-level moisture increased during the night from the south to west. 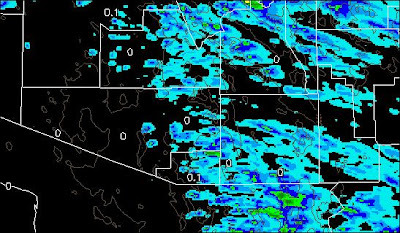 There is a pronounced PW gradient across southern Arizona, with values approaching 2.00" in the west, while in the Tucson area values are around 1.25". 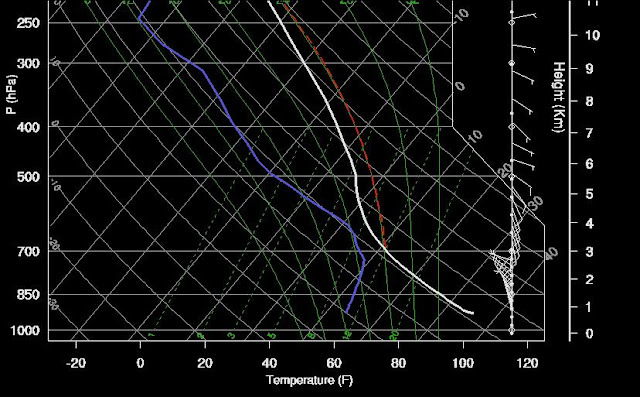 The morning sounding from Tucson (skewT plot above), shows the cool and more moist low-levels, but with a dry layer remaining from around 600 to 500 mb. The easterlies below 700 mb are essentially gone; steering flow is apparently from the southeast; and upper-level winds are from the west. The SPC diagnostics forecast an afternoon surface-CAPE of nearly 2000 J/kg. So, the day starts with more favorable conditions for storms in eastern Pima County than we've seen for a number of days. 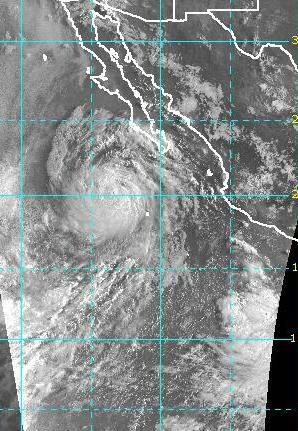 Hurricane Ileana is southwest of the southern tip of Baja (visible image below is for 7 am MST), but is forecast to move slowly to the northwest. Latest blended PW (above from CIRA at 6 am) indicates that high PW already is in place, so the possible role of Ileana would only be to broaden the plume of moisture over the Southwest. 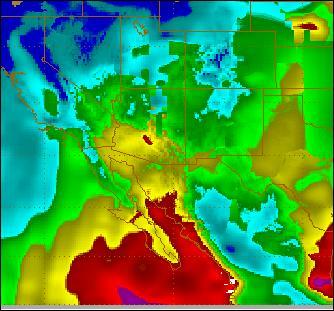 Moisture is high into southern California and northward into southern Nevada and Utah. The 500 mb data indicate several weak troughs moving northward along the GoC. The large-scale setting is favorable for more storms to our west and northwest (note that Yuma had a thunderstorm at sunrise this morning and there were a couple of severe thunderstorm reports yesterday in California and along the Colorado River). Once again, the early WRF-GFS model run has failed, so no high-resolution forecast data available. It appears that low-level winds (while weak) will be from the southwest to west today, which will keep the PW values steady, or on the increase. It appears that we should see thunderstorms in central and eastern Pima County this afternoon and evening. It remains to be seen if storms will move into lower elevations. But, an upturn appears to be underway - check the 12 UTC runs of Atmo's WRF later this morning. 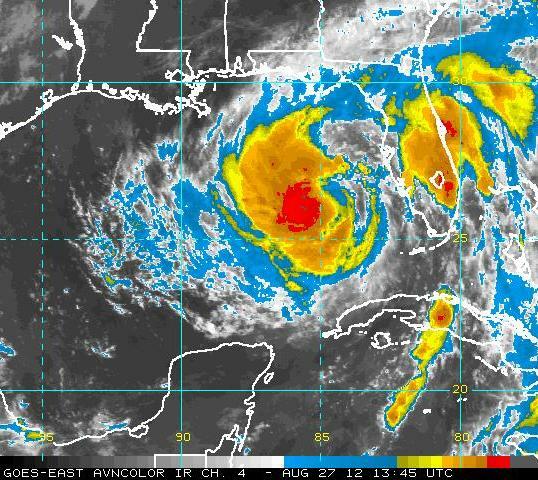 Hurricane Isaac remains near the Gulf Coast, south of New Orleans. 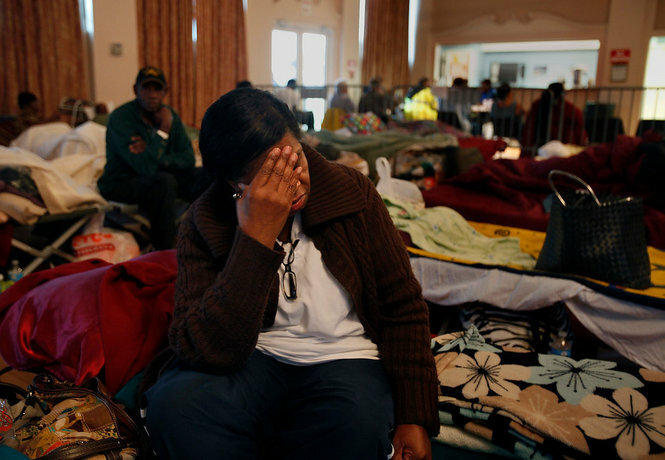 Heavy rains and the storm surge are causing much misery, as many have been ordered to evacuate (above photo by Carolyn Cole, LA Times). The surface plot from 1345 UTC this morning (above) shows the center of Isaac's circulation south of New Orleans, with widespread heavy rains. IR image at 1315 UTC is shown below. In contrast, here in southeastern Arizona we will deal with more dry heat. 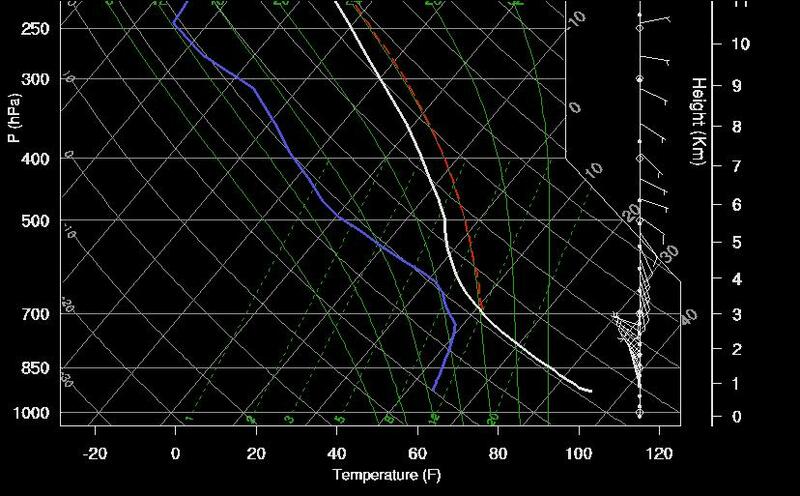 This morning's skewT plot of the Tucson sounding (above) indicates dry and stable conditions. Winds are becoming light, with only some east winds of 20 to 30 kt left in a layer around 600 mb. 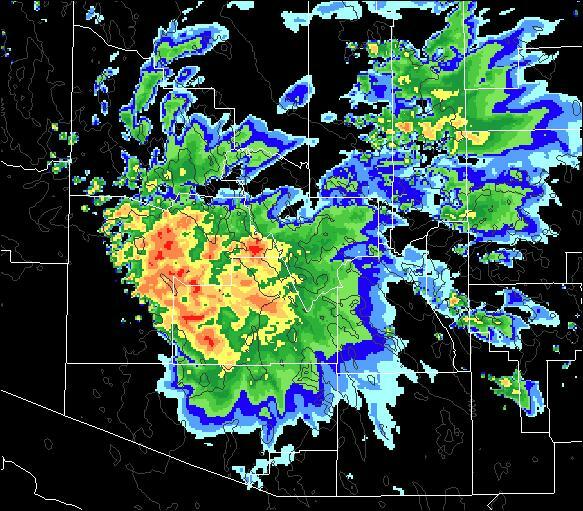 Conditions are more moist out in southwest Arizona - Yuma reports a Td of 77F at 7 am MST this morning. Remains unclear as to whether Ileana will have any impacts on southeastern Arizona over the Labor Day weekend. No WRF-GFS run this morning. 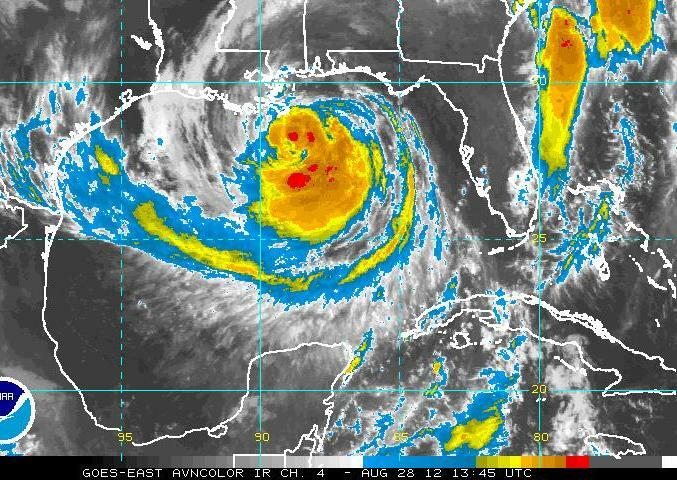 Tropical Storm Isaac (above at 1345 UTC this morning) is approaching the Louisiana coast today. It is not clear whether or not the storm will become a hurricane before it goes ashore. However, Isaac poses serious storm surge threats, due to the long fetch of strong winds over the Gulf to the east of its center. Meanwhile TS Ileana has formed in the east Pacific - below is an IR image from 14 UTC this morning. 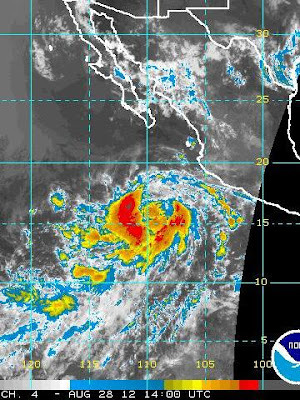 Ileana is forecast to move northwestward (current NHC forecast above), crossing 20N 115W. It is not clear whether Ileana will push more moist air into the lower Colorado River Basin. The CIRA blended PW product from 14 UTC (below) shows that high PW values already extend into southwestern Arizona (as forecast by the WRF-GFS yesterday). Hector had strong influences on keeping mT air in the Southwest, but he had a more northerly track. Will have to watch Ileana the next several days, given that very high PW is very close! There were isolated thunderstorms again yesterday afternoon with generally light rain amounts. The airport and DM AFB both recorded thunder and very light showers. Here at house we had a nice, cool outflow in the late afternoon, around 5 pm MST, that broke the 100+ heat - but no rain. Douglas had a severe thunderstorm with gusts to 60 mph a bit before 6 pm. Across the ALERT network 14 sites (15% areal coverage) had rainfall. Amounts were quite light, however, Avra Valley Airpark measured 0.47". Strong east winds will bring the second intrusion of dry air across the metro area this month (the first started on August 9th). 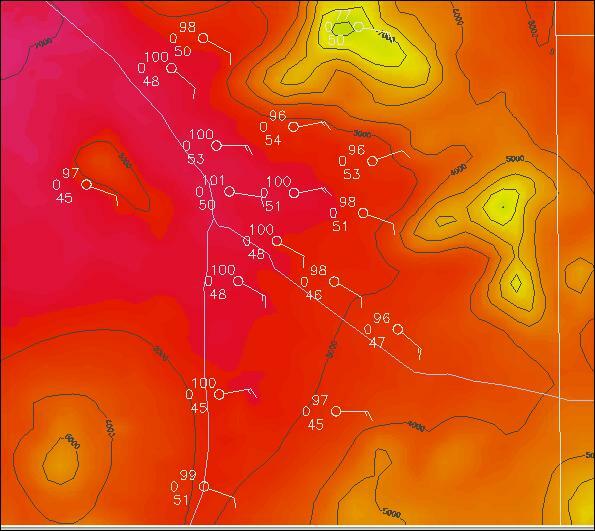 Above is early WRF-GFS forecast of surface conditions across the metro area at 4 pm MST this afternoon - not a pretty picture. 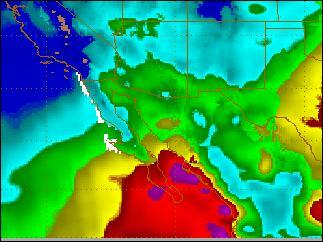 The forecast of PW at the same time is shown below, indicating that the model keeps central and western Pima County in the more moist air. Bottom is the forecast of composite radar echoes at 4 pm, with storms from south to west of the metro area. Today will be hot with desiccating east winds - saw that Mt. Hopkins RAWS had east winds at 33 gust to 44 mph a bit ago. It will be interesting to see if significant storms can make a come back before the end of August. 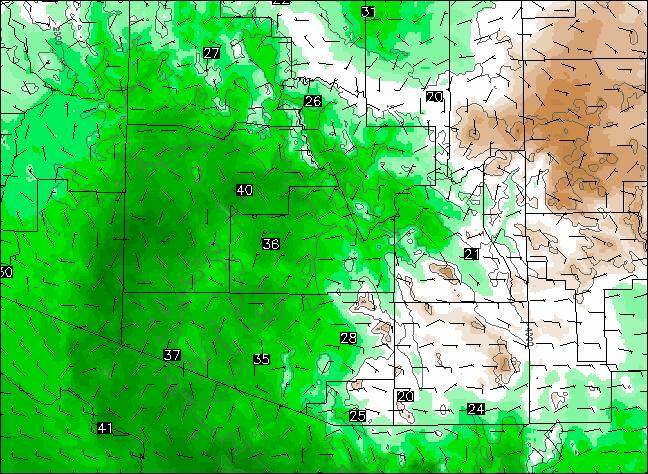 It appears that warming and drying low-level easterly winds will invade southeastern Arizona this afternoon. Timing is fairly critical, since PWs are currently around an 1.50". Yesterday it appeared that the best forecast was a mix of the early and 12 UTC WRF-GFS. There were more storms around, but they stayed mostly on the higher elevations. Only 9 stations in the ALERT network had rainfall; however, White Tail on Mt. Lemmon reported 1.14" - far and away the highest amount. Very scenic skies both at sunset and sunrise. 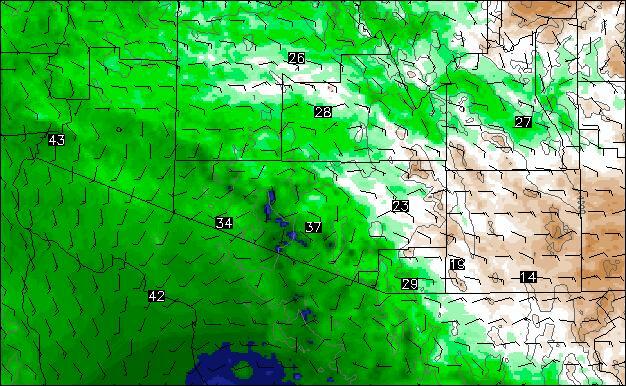 The early WRF-GFS today indicates some early shower development over eastern Pima County (above is composite radar forecast valid at 2 pm MST this afternoon). Then the forecast indicates easterly winds later in the afternoon. The forecast of PW for 8 pm is shown below. The battle will intensify tomorrow and Wednesday, as a significant push of very moist, low-level air and high CAPE is forecast into southwestern Arizona. Finally, it appears that Isaac is taking aim at New Orleans (IR image below is from 1345 UTC this morning), just as was Katrina eight years ago! The 12 UTC run of the Atmo WRF-GFS model this morning forecasts thunderstorm activity to extend into eastern Pima County this afternoon. 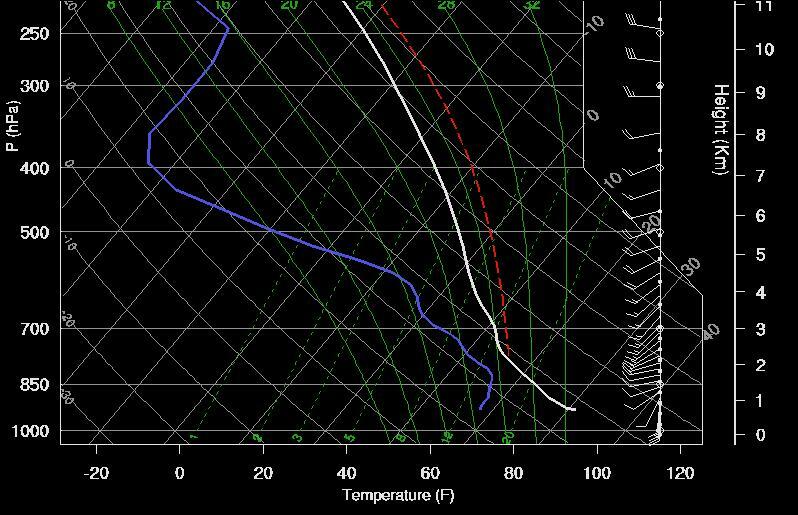 The 3 pm forecast sounding for Tucson has developed CAPE - apparently due to low-level moisture convergence and hot temperatures. The new forecast of total rainfall through midnight (below) shows that the morning model run has shifted the maximum activity into Santa Cruz and eastern Pima County. 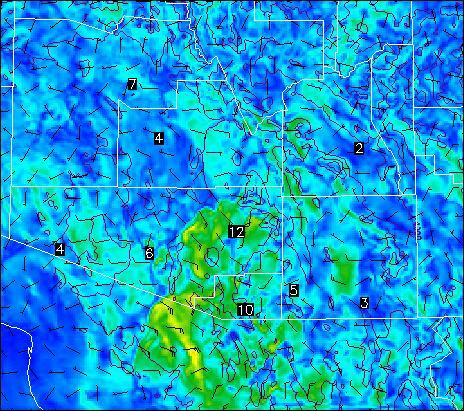 By 8 pm the 10-m wind forecast indicates several outflow boundaries sloshing around southeastern Arizona and northern Mexico. 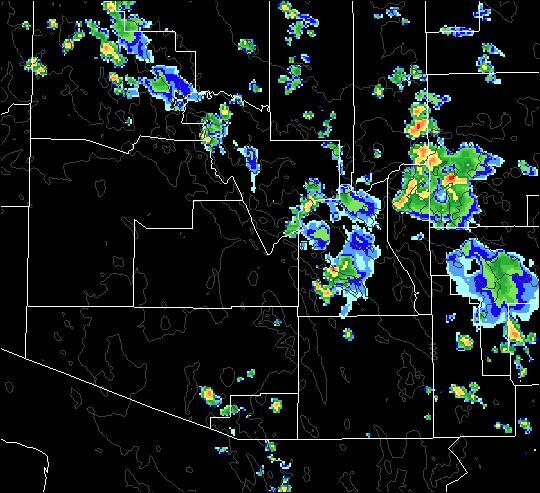 The current composite radar (below for 12:30 pm MST) indicates that thundershowers have already developed in eastern Pima County. So the new forecast run seems to have a better track on things. Weather interest today will be centered on TS Isaac, as it heads into the Gulf of Mexico. Forecast models forecast strengthening into a hurricane, but remain to have a large spread for Isaac's track after 36-hours. This leaves uncertainty about where the storm might actually make landfall - so, emergency managers along the Gulf Coast as far west as New Orleans will be facing a tough decision making situation today and Monday. First day of Republican Convention has been cancelled - short-term weather they accept. 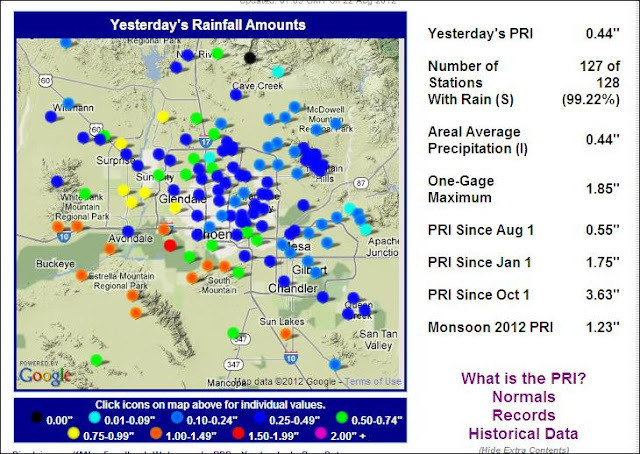 Precipitable water is creeping up over southeast Arizona and decreasing over southwest portion of the state (above is CIRA blended PW product for 12z this morning, 26 August, with green shades indicating amounts from 1.00" to 1.50"). I found no reports of rainfall in eastern Pima County for past 24-hours, however there were Cbs off to east and northeast during the afternoon. 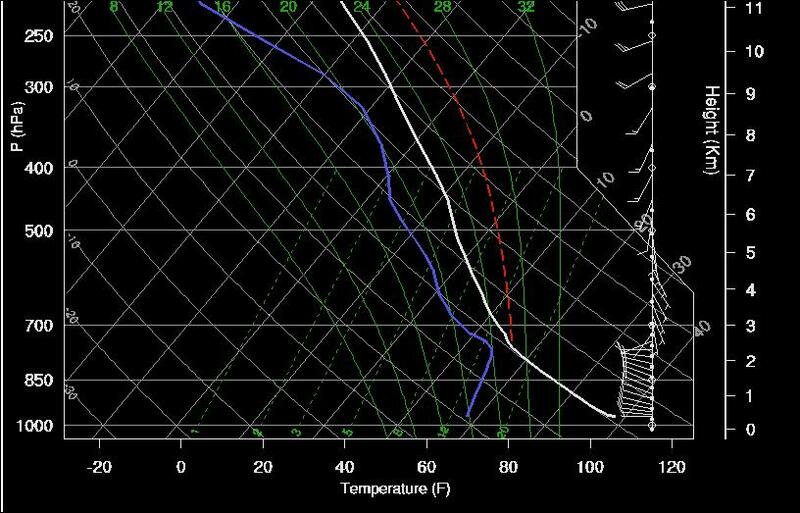 This morning's Tucson sounding (skewT below from SPC) indicates that upper-levels have moistened up some. Winds aloft are light and variable - the 500 mb anticyclone is centered in northwestern New Mexico and at 250 mb it is nearly overhead. The sounding indicates, at most, a sliver of CAPE at low elevations this afternoon. The early run of the WRF-GFS model (above is forecast of composite radar echoes at 4 pm MST this afternoon) indicates increased thundershower activity to the east of Tucson today. 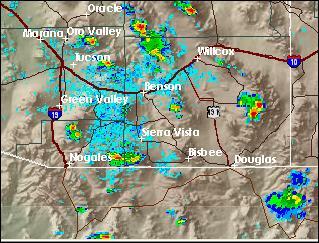 Some Cochise County storms make it west to near the Rincons, before dissipating. The total rainfall predicted by the WRF-GFS through midnight tonight is shown below. Yesterday there were buildups over the mountains at times and very isolated thundershowers to the east and south of Tucson. 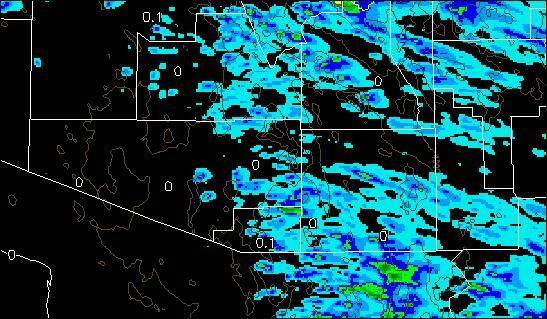 Across the ALERT network 8 stations - mostly far east and in the Catalinas - measured very light rain amounts. 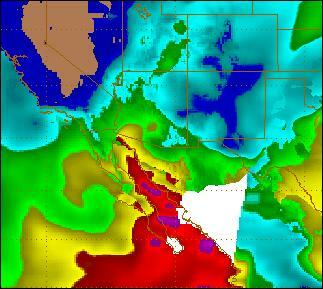 The CIRA blended PW (above - with golds > 1.50" and greens > 1.00") shows that higher PW amounts persist across southwestern Arizona and the California deserts. 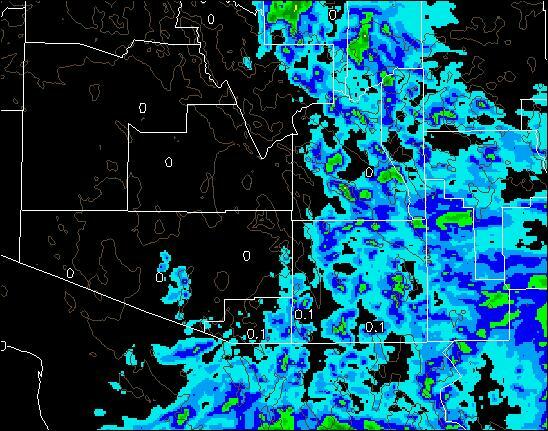 With cooler air advecting over Arizona at middle levels, there may a slight increase in thundershower activity, especially to the north and northeast of Tucson (below is early WRF-GFS composite radar forecast for 5 pm this afternoon). While the model forecasts rebuild the 500 mb anticyclone over our region, height gradients and wind fields are forecast to be very slight. So, we will have to watch to see whether enough moisture influx develops to support a round of storms during the coming week. Dry and warm air in the middle and upper-troposphere dominated yesterday, and there were only some very isolated thundershowers to the east and southeast of Tucson (above is regional radar at 5 pm MST from NCAR RAL). The early WRF-GFS forecast the down trend for yesterday and actually things ended up more suppressed than the early run had forecast. There is still low-level moisture across southern Arizona with highest PW values stretching from Phoenix to Yuma - values in Pima County are around 1.25". The early WRF-GFS forecast for today indicates more isolated showers within the current deep westerly flow. 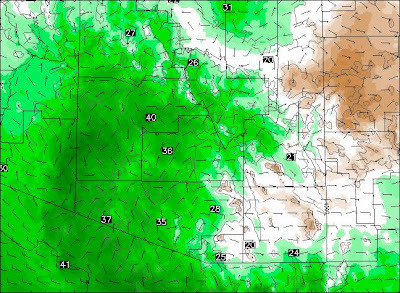 Models predict that the 500 mb anticyclone will redevelop quickly to the north, so the question of interest will be whether it sets up in a way that allows cooler, middle-level flow from the east to south to return to southeastern Arizona. Meanwhile, TS Isaac will be approaching Haiti and western Cuba today and tomorrow (latest NHC forecast is shown below). 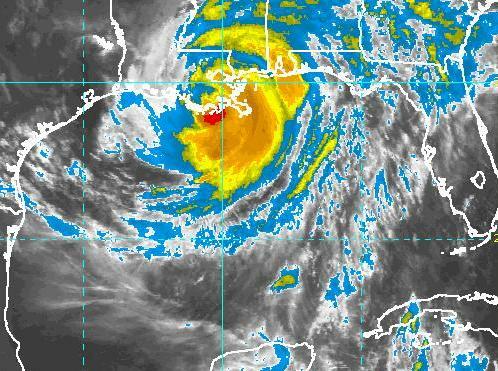 Storm is expected to intensify to hurricane strength once it is over the Gulf of Mexico. the current NHC forecast indicates landfall near Mobile, Alabama, next Tuesday night. The 500 mb, short-wave trough we've been talking about has moved over the Great Basin this morning, with showers curving east and south (see visible satellite image above for 7:15 am MST). We had several periods of showers and thundershowers yesterday, but the heaviest rains across Tucson occurred with the morning band of rain. Across the ALERT network 24-hour coverage this morning was 100% - 45 sites measured more than half an inch and 8 locations had over an inch. Here at the house there was 0.88" in the gauge at 6 am this morning, but 0.82" of that fell yesterday from 9 am to noon. The air in low levels remains very moist (see CIRA blended PW below - yellows are over an inch and a half). However, very dry air is intruding across the state in the upper-half of the troposphere. 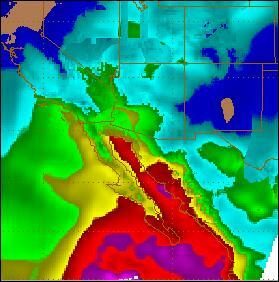 Above is the WRF-GFS skew-T at Tucson forecast for noon. The winds are westerly through the troposphere and the dry air aloft has mixed downward and extends below 500 mb. The model forecasts continuing CAPE, but developing storms will face a hostile environment above 600 or so mb. The convective towers the last two days have tended to be soft and fuzzy, somewhat tropical-like. Today it will be a battle of low-level CAPE versus warm, dry air aloft. The early WRF-GFS (forecast of total rainfall through midnight, below) forecasts that the back edge of storms and rain today will be just west of the Tucson area. It won't surprise me if the 12 UTC runs of the WRF shift the back edge further east. Jack Hales has sent a link to a nice video of a thunderstorm developing over the Superstition Mountains east of Phoenix. The storm developed yesterday afternoon, 21 August. There was no Tucson sounding yesterday evening. This morning's sounding (above from SPC) isn't going to tell us much, since something went seriously bonkers. There is heavy cloud cover this morning, and the IR satellite image at 8:30 am MST (above) indicates a large, active MCS in northern Mexico and parts of southeast Arizona. The Tucson composite radar image (below at 8:25 am) indicates thunderstorms both to the southeast and west of Tucson. The latest NAM forecast for 500 mb (above valid at 5 pm this evening) indicates a short-wave in the westerlies moving across the Southwest. This is the first intrusion from the Pacific in along while. None of the models seem to have a good early forecast (relative to actual precipitation occurring) this morning, and we'll just have to watch as things evolve today. 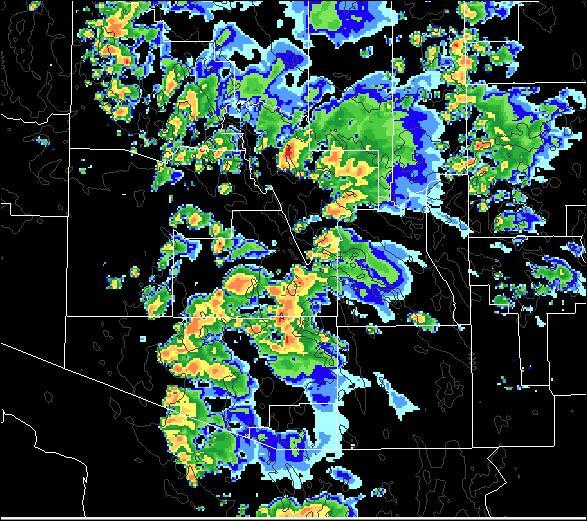 Above is 8 pm MST regional radar (from NCAR RAL) showing heaviest storms already west of Tucson, out in central Pima County. Phoenix had a nice, widespread storm and rain event, not as severe as the forecast by early WRF-GFS. The Phoenix Rain Index for 24-hours ending at 07 UTC this morning is below. 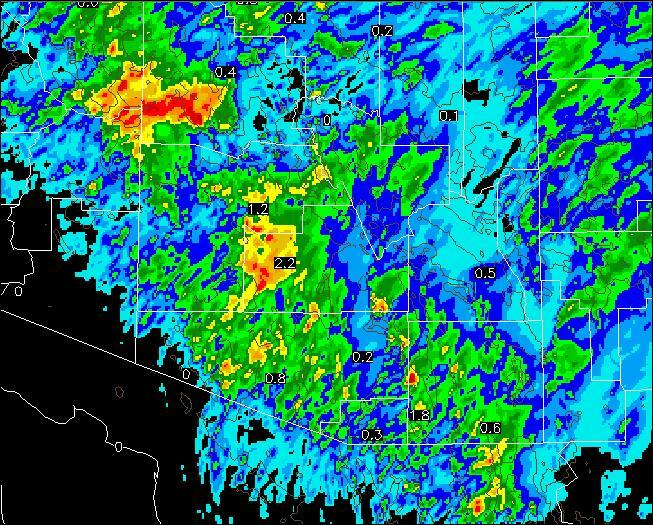 Heaviest amounts up there occurred a bit south of the metro area - the 12 UTC WRF-GFS forecast shifted the heaviest storms south into Pinal County. I would say that the models had a pretty good lock on the events of yesterday. 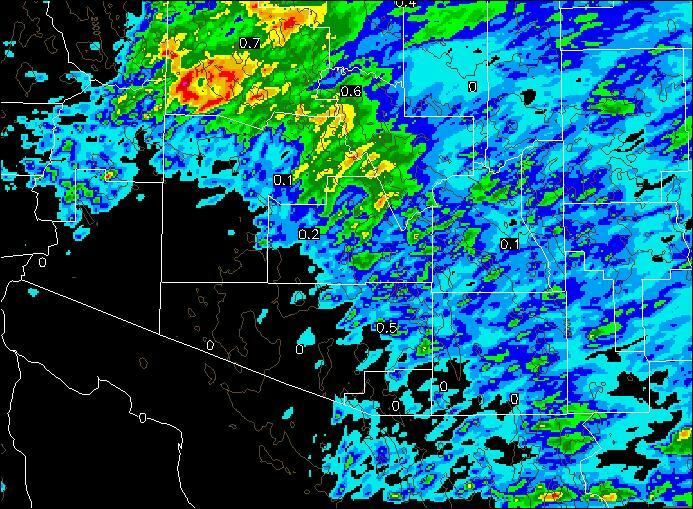 Here in the Tucson area coverage of rainfall was considerably up, as forecast by the early WRF (from 20% on Monday to 60% across the ALERT network yesterday). Heaviest amounts were again at higher elevations. A heavy storm moved by just to the southwest of here, leaving us with only 0.09" at the house. Two sites in the Catalinas had over an inch, as did Haystack Mountain, off to the south-southwest of Tucson. There were 12 sites with over half an inch. 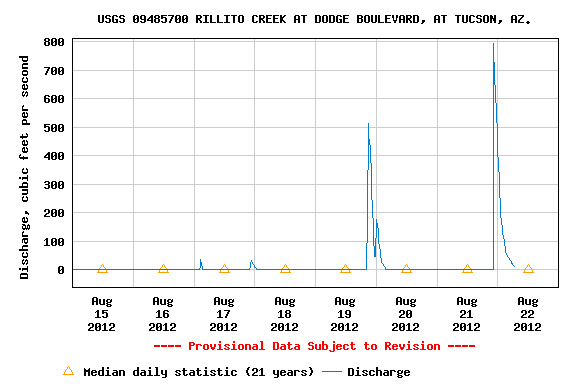 Below is a plot of stream flow at the USGS Rillito at Dodge gauge, showing a peak flow of 800 cfs during the night. This was the second morning this week that there was water running in the Rillito during my morning walk. Big Storm Event Today In Phoenix? Yesterday Atmo's early run of its high-resolution, WRF-GFS forecast model predicted the day's trend correctly for the third consecutive day. In eastern Pima County there were only isolated storms. The storms did produce some gusty outflows, Here at the house we had an outflow from the north during the afternoon and then a much stronger outflow from the south around dark - no thunder and no rain. 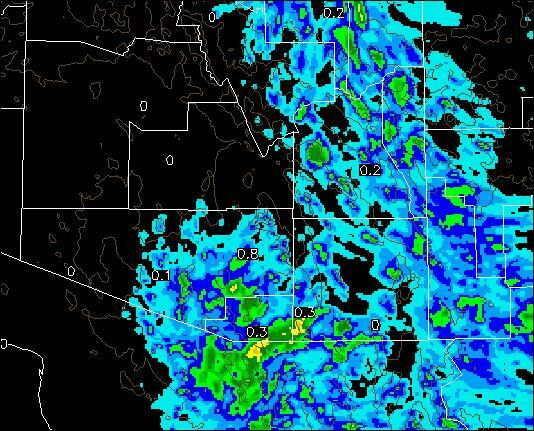 Across the ALERT network only a bit over 20% of the higher elevation sites had rainfall - metro Tucson was pretty much suppressed except for a later afternoon storm south of the airport. Today the early WRF-GFS forecasts another substantial upturn of thunderstorm activity. This occurs as the 500 mb anticyclone is pushed toward the east because of a trough in the westerlies approaching the west coast. Winds become southerly to southeasterly aloft and increase in strength above 500 mb. Today I'll focus on Phoenix, since that's what the model forecast does (note that the new run of the NAM also seems to focus on Phoenix). 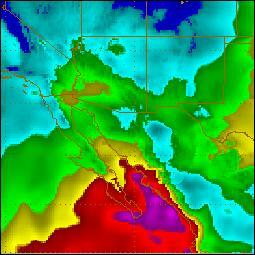 The model forecasts CAPE at almost 3000 J/Kg by mid-afternoon at Phoenix (above). 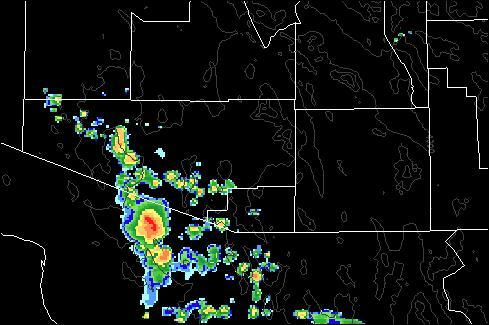 At 3 pm MST (below) the GFS-WRF forecast of composite radar echoes has Phoenix essentially surrounded (good for converging outflows in the Valley), and substantial storms in eastern and central Pima County. 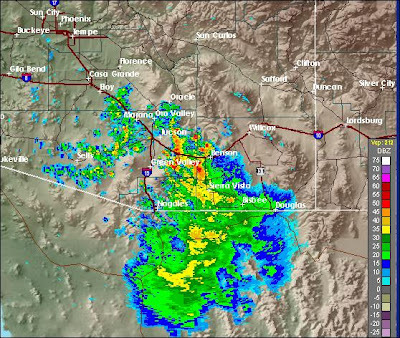 By 8 pm storms have exploded over eastern Maricopa County (composite radar at 8 above). 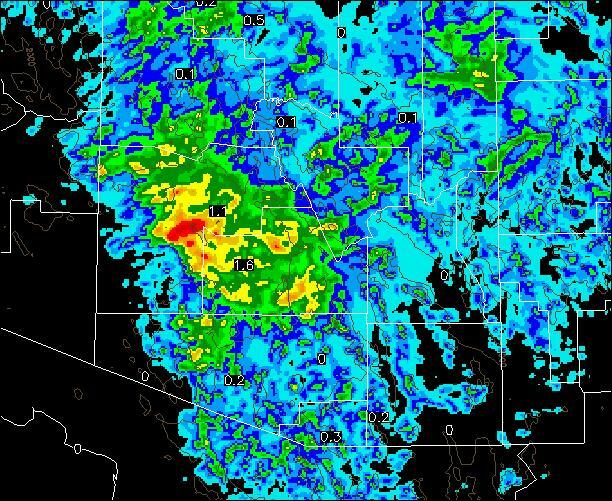 The model forecast of rainfall through midnight is below - nice increase over Pima County, but serious rainfall predicted in the Phoenix area (bright red indicates over 3 inches!). If model has this right today - batten down the hatches in the Valley!